A very old 19th Century print, probably French or English, titled: Officier de Grenadiers de la Garde Nationale, 1792. The Revolutionary Guards formed after July 1792 from the troops which turned over to the Revolutionaries. This was later renamed "Garde Impériale" after the formation of the Empire in 1804, and were the élite and most loyal troops to Napoléon, also known as la Vieille Garde. From an auction in Hamburg around 1979, late 20th Century gilt frame. A very old 19th Century print, hand coloured portrait of Napoléon I. in a glazed gilt stukko frame, probably contemporary to the print. Source of this work unknown, possibly France or England. Purchased by my father in Londons Portobello Road in the late 1960s. A porcelain bisque bust of Napoléon I., dated to the reverse, 1803, this being probably not the date of manufacture but of a period impression. Possibly from the Manufacture de Capodimonte. Purchased by my father around 1970. 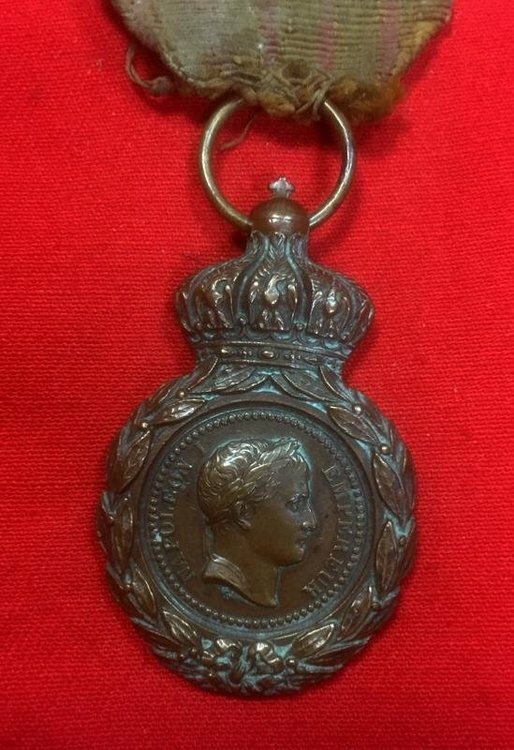 A bronze commemorative medal, Napoleon I, Roi et Empereur. Pewter with a toned bronze finish, Artists signature, Andrieu F. Reverse blank. Both items purchased by my father in the late 1960s / early 1970s. 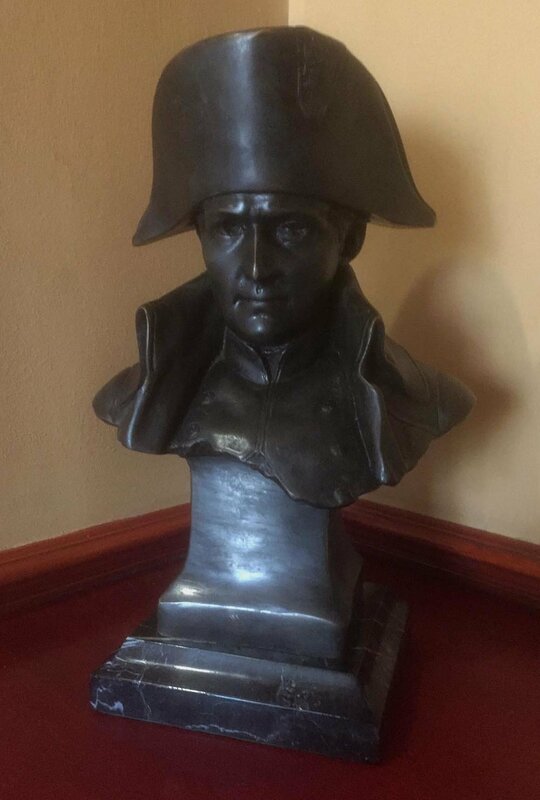 Here is my bust of Napoleon, it's quite large at 13 and half inches high. 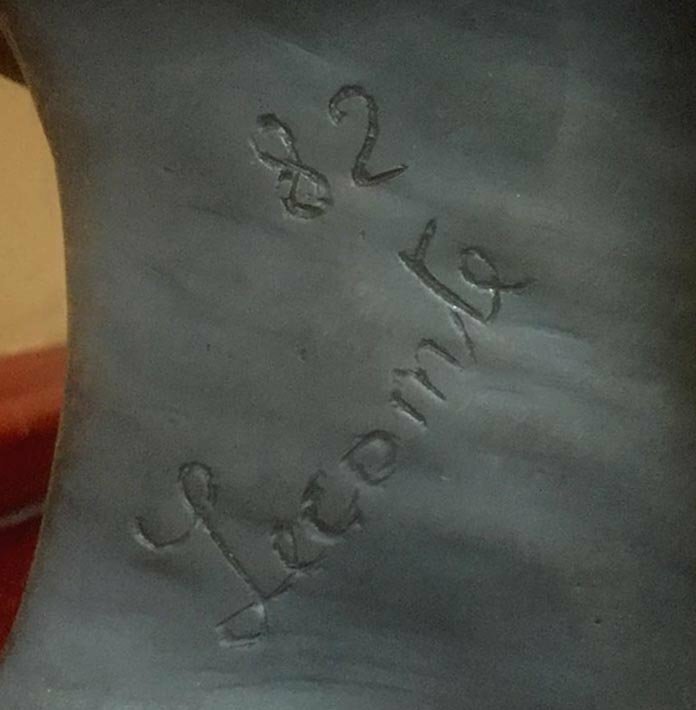 I've had it for years and just noticed when I photographed it there, that it is signed to the reverse Lecomte 82. On further research this is the artist. It's amazing what you can find out with a little research I was totally unaware of all of this. 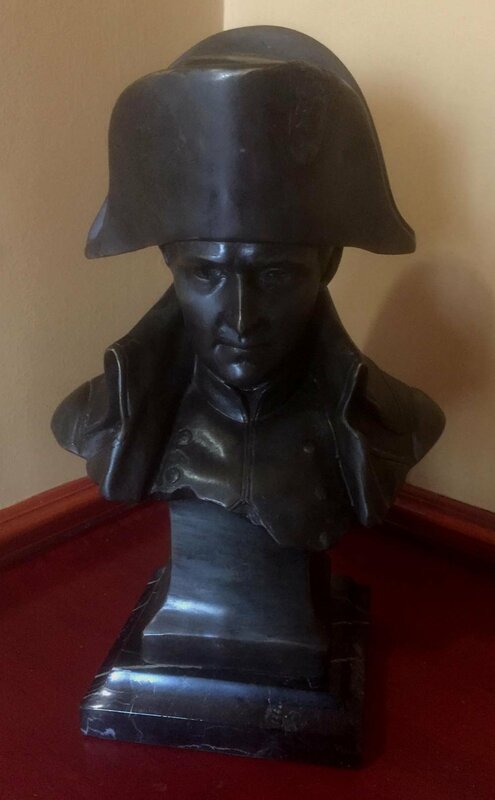 Late 19th Century French signed bronze bust study of the Emperor Napoleon Bonaparte. Bronze bust study depicting the Emperor in his role as Commander General of the French armies ,shown wearing his bicorne hat with decoration and a high-collared military coat. The study inscribed and signed to the rear "Lecomte 82" (1882) and mounted on a green Verde antico marble base with a moulded edge. Jean-Jules-Antoine Lecomte du Nouÿ (10 June 1842 in Paris – 19 February 1923 in Paris) was an Orientalist French painter and sculptor. 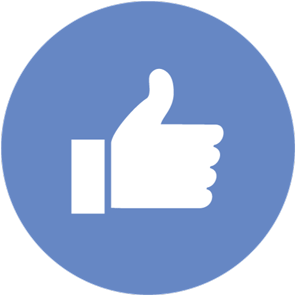 He was strongly influenced by the works and teachings of Charles Gleyre and Jean-Léon Gérôme. Lecomte du Nouÿ found inspiration for his art through extensive travels to Greece, Turkey, Egypt and Italy. The thematic content of Lecomte du Nouÿ’s work was mainly figural, but also spanned over a vast range of imagery throughout his career, including classical, historical and religious.Lecomte du Nouÿ is known for remaining faithful to his detailed, realistic style throughout the extent of his career, despite the onset of the Impressionist, Fauvist and Constructivist artistic movements during his lifetime. His work is said to have contributed significantly to the establishment of an iconic repertoire representing the Orient in the nineteenth century. A Parisian street was named after him in 1932. 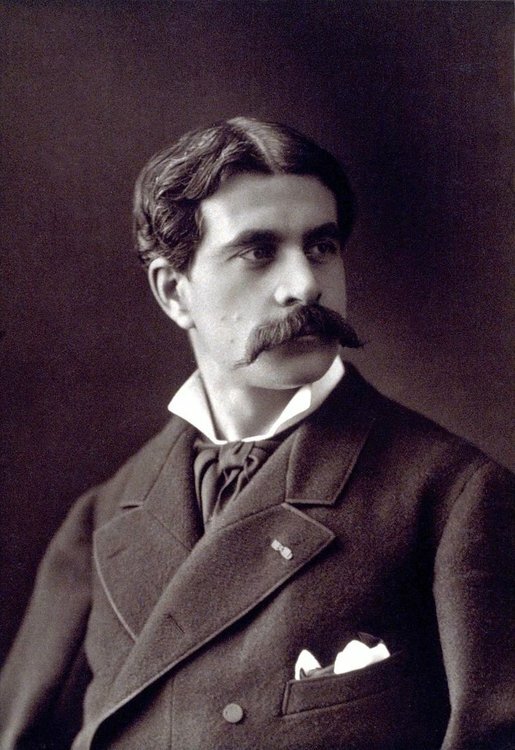 Jean-Jules-Antoine was born on 10 June 1842 in Paris. 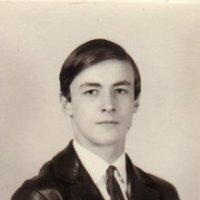 Originally of a Piedmontese origin, his family had been settled in France since the fourteenth century and by the time of his birth had reached the status of nobility. Lecomte du Nouÿ showed a strong attachment to visual art from a young age and was reported to have painted portraits of his father and uncle by the age of 6. In 1861, at 19 years of age, the artistic talents of young Jean-Jules-Antoine Lecomte du Nouÿ prompted him to become a pupil at the atelier of Swiss artist, Charles Gleyre. Under Gleyre’s guidance Jean-Jules-Antoine learned the significance of individualistic style and gained the foundations of creative visual presentation. Later, Lecomte du Nouy further perfected his knowledge of the artistic form under the mentorship of Jean-Léon Gérôme, who was a renowned painter of the Academicism movement. It was at this time that Jean-Jules-Antoine learned the precision required to depict la belle nature—a style of illustration that aims to create the most beautiful representations of the natural form. This later became one of the main techniques employed in Lecomte du Nouÿ’s signature artwork. In 1865, Jean-Jules-Antoine accompanied fellow artist, Félix Auguste Clément, on his travels to Cairo, Egypt. It was after this voyage that the young Lecompte du Nouy sought to portray the opulence of the Orient. In later years, Jean continued his travels, visiting countries like Italy and Greece. Lecompte du Nouy found inspiration in all social, historical and literary facets of foreign culture. The Orientalist style is largely characterized by its content, but also by its subdued realism and precision allotted towards depicting the human form. The latter is a prominent characteristic of the 19th century methods upheld by the Académie des Beaux-Arts. Jean-Jules-Antoine was a prominent figure within the sphere of academic art and thereby would adhere to a rule-based artistic style of well-developed skill and formal composition. The artistic composition of Lecomte du Nouy’s paintings was often complemented by the use of half-light, which added certain dramatic and melancholic qualities to his work. To this day some, like Professor Alan Braddock, consider Jean-Jules-Antoine to have been decidedly modern for his time, because his work directly and indirectly broached some of the key issues of his day, albeit from a decidedly conservative perspective: colonialism, international trade, gender, religion, and history. Jean-Jules-Antoine spent most of the later years of his life in Romania. There he painted primarily the royal family and their subjects. However, he returned to Paris right before the onset of his death, which occurred on 19 February 1923. This painting refers to an event that occurred at the beginning of Bonaparte's career, when he was still a young captain. He was in charge of conveying powder intended for soldiers of the Army of Italy, in the middle of the federalist insurrection of the South. 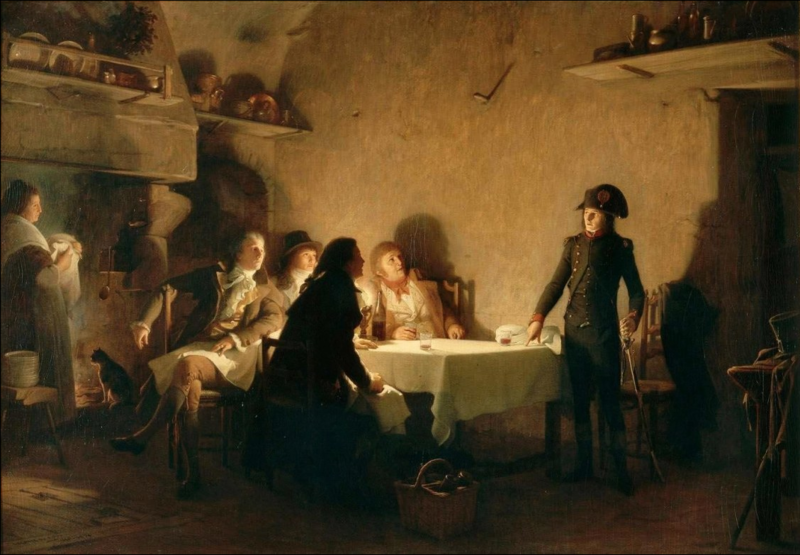 On the 28th of July, 1793, he went down to Beaucaire to the house of M. Renaudet, a chemist, and in the evening he dined in an inn with four merchants who had come for the fair. It was after this meal that he wrote a dialogue entitled Le Souper de Beaucaire, in which he made a profession of republican faith, trying to convince his interlocutors of the necessity of the Revolution. The painting is like a luminist canvas highlighting the young officer facing his detractors. The light seems to emanate from him, he is already almost the god that he will become later and seems to really carry the truth in him. But this vision of the artist contrasts with the domestic decor of the inn: the fireplace, the table and the reliefs of the meal. The composition is inspired by works by Rembrandt such as The Pilgrims of Emmaus, the Louvre. It is especially interesting to consider the dates of the composition. Count Noüy began his painting at the end of the Second Empire in 1869. The events of 1870 and the fall of Napoleon III forced him to abandon it. It was not completed until 1894. Why so late? In fact, the beginnings of the Third Republic turned to the advantage of the royalists, and, without the clumsiness of the Count de Chambord, it is probable that the monarchy would have been restored. To paint a Napoleonic work in these circumstances was therefore very delicate, and it was only when the Republic was definitively established, and even after the episode of General Boulanger, that the painter completed his painting.The vindictive spirit, maintained by the memory lost provinces (Alsace and Lorraine), then raised a nationalist fever that revived the memory of the Empire, and many artists produced Napoleonic subjects. But the subject of Lecomte du Noüy was not trivial: the painter did not represent an event in the life of Napoleon, the First Consul or the victorious general in Italy and Egypt. It was indeed the young Bonaparte Jacobin, close to Augustin Robespierre, the brother of the Incorruptible, which Lecomte du Noüy put on the stage. The picture could therefore only appear in the strictly radical context of the last decade of the nineteenth century. That's really worth holding on to. 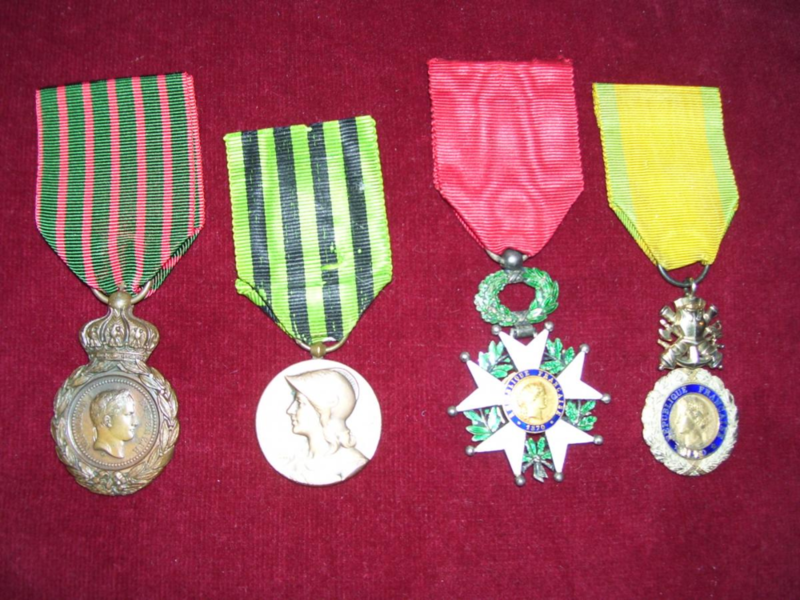 Souvenirs of Napoleon have been very much produced till recently, often for tourists and cheap quality. The older, the better, and being bronze and 19th century, even if late, is a good keepsake. The name Lecomte also sounds familiar, encountered during earlier visits to French museums. Very collectable. Thanks Fritz, I also have a couple of very old books about Napoleon, possibly from the Napoleonic period or just after, I will need to try to find them and photograph these too. 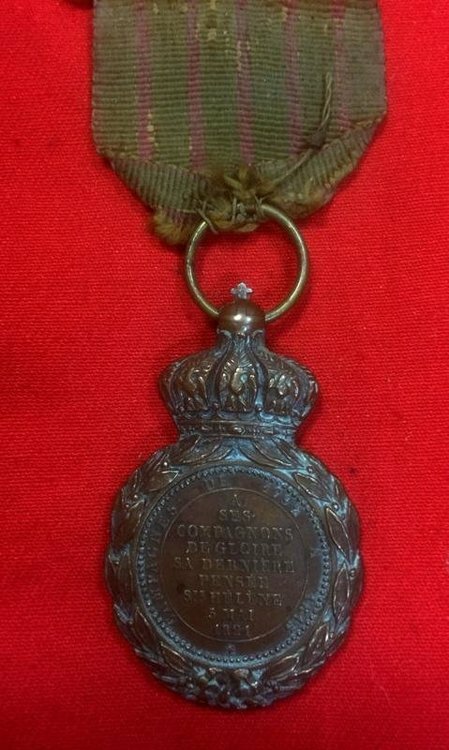 In the meantime here is a nice medal we have in stock at the moment, very hard to find with the original ribbon. 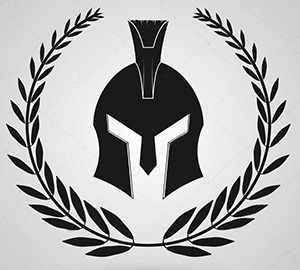 Very nice, similar to the ribbon of the Croix de Guerre 14-18, just a century older. I also have this medal, but on a replacement ribbon. 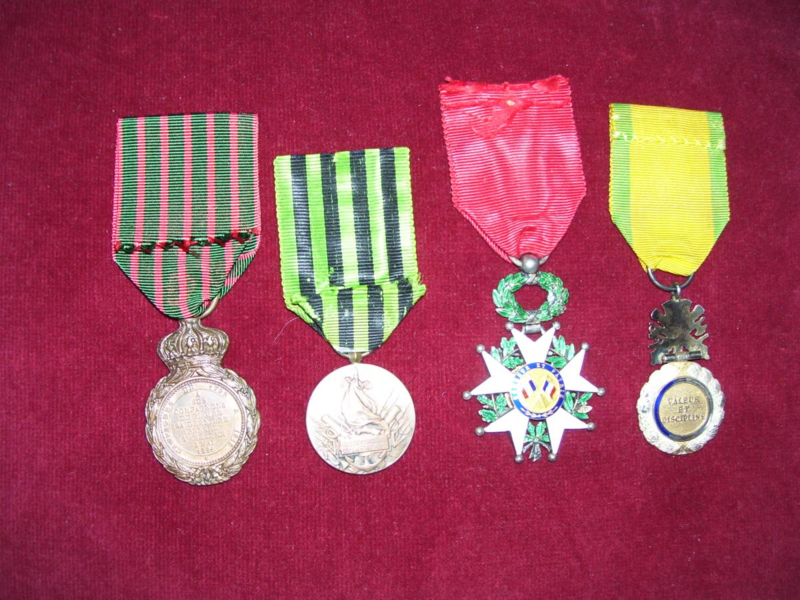 This was awarded by Napoleon III. very much later, after 1848.